The San Diego State Aztecs will host Mountain West foe San Jose State on Wednesday night at 7:00 pm at Viejas Arena. The Aztecs (9-6 & 2-0) will enter Wednesday night’s game as the heavy favorite against San Jose State (5-9 & 0-2). The Aztecs are 3-0 against the Spartans since they entered the Mountain West in 2013. The players to watch in Wednesday’s game for SDSU are Jeremy Hemsley, Zylan Cheatham and Winston Shepard. Hemsley enters the game against SJSU averaging 13.1 points and 2.9 rebounds and leads the team in assists averaging 2.5 in 15 games this season. Shepard enters the game against SJSU averaging 10.0 points and 5.8 rebounds in 15 games this season. Cheatham enters the game against SJSU averaging 8.7 points and 5.9 rebounds in 15 games this season. The Aztecs are still trying to improve with shooting from the floor and behind the arc. The Aztecs are shooting 41.2% from the floor and 30.6% from behind the arc. The Aztecs need major improvement in the free throw game but have improved their free throw shooting average to 68.6%. The Aztecs have also been working harder this season on offensive and defensive rebounds. To date the Aztecs have outrebounded opponents 586 to 499. San Diego State’s opponents has been averaging a field goal percentage of just 36.3% and 33.9% from beyond the arc. 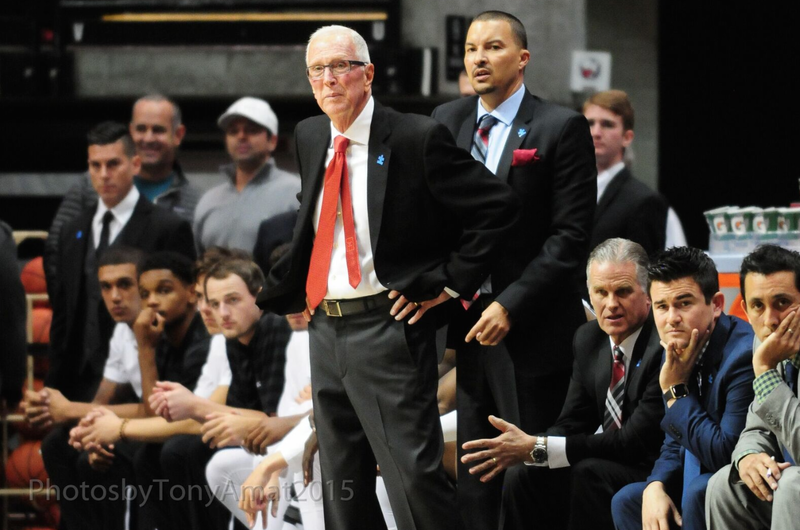 The Aztecs have been bringing press on opponents this season thanks to a very deep bench. This has allowed the Aztecs to use the full court press for a majority of every game. Opponents also have to practice playing against the Aztecs dreaded 1-3-1 and 2-3 zone. Expect San Diego State use eight men tonight even though the Aztecs carry 10. The Spartans have some height on their team with Princeton Onwas (6-7), Cody Schwartz (6-8), Brandon Clarke (6-8), Ivo Basor (6-8), Frank Rogers (6-9), Ryan Singer (6-10), Ashtin Chastain (6-11), and Leon Bahner (6-11). The players to watch in Wednesday’s game for San Jose State are Frank Rogers, Princeton Onwas, Ryan Welage. and Cody Schwartz. Rogers enters the game against SDSU averaging 14.8 points and 7.9 rebounds in 14 games this season. Onwas enters the game against SDSU averaging 10.6 points, 4.1 rebounds and 3.2 assists in 14 games this season. Welage enters the game against SDSU averaging 10.5 points and 6.6 rebounds in 14 games this season. Schwartz enters the game against SDSU averaging 7.9 points and 0.9 rebounds in 14 games this season. Game information: Tipoff 7:00 p.m. PT in San Diego, California. A limited amount of tickets for Wednesday’s San Diego State men’s basketball home game vs. San José State are available now. The ticket supply comes from SDSU athletic department holds and SJSU team returns. The game is set for a 7 p.m. PT start on Steve Fisher Court at Viejas Arena. Fans interested in purchasing tickets, which start at $20, can buy them at GoAztecs.com, at the Aztec Ticket Office – Window E at Qualcomm Stadium, or by phone at (619) 283-7378. A limited amount of student tickets are also available at the Viejas Arena box office during normal business hours. Current students must present their valid RedID.